What’s next for Facebook? Trying to make enough money to justify that $100 billion valuation. Zuckerberg never wanted to go public. “Simply put,” he wrote in the letter that accompanied the filing, “we don’t build services to make money; we make money to build services.” And then there’s the 57% of Facebook’s voting shares that he’ll control post-IPO, along with near-absolute power to designate his successor. Just what is Zuck so worried about? In short: He’s determined to avoid becoming the next Google. In conversations with people at Facebook over the years, I’ve heard the same fear repeated again and again. Many employees are former Googlers, who say that after the search company went public it betrayed its mission. No, not that “don’t be evil” business. Google abandoned its commitment to being a search-technology company that boasted, “It’s best to do one thing really, really well,” instead jumping on every me-too product idea to come along, from smartphones to suboceanic energy lines. By the end of 2011, Google had ballooned to 32,000 employees. Facebook (current population: 3,200) is at a fork in the road. “I think Zuckerberg is in for a huge surprise,” says Sandeep Dahiya, associate professor of finance at Georgetown University’s McDonough School of Business. “When I ask CEOs of new public companies what their biggest challenge is, they always tell me they had no idea how much time they’d have to spend telling analysts how they plan to make money in 90 days.” So which path will Zuckerberg pursue in his new life? Will he now adopt the Google way, firm in a belief that his company can stretch its mission to accommodate anything and everything? Or will it follow the precepts of the early-era Microsoft and the modern-day Apple, carefully pursuing just a few big things? The major challenge of Facebook’s current business is the massive valuation that will likely result from its debut on the public markets. The company may well be valued at more than $100 billion, a number that assumes incredible growth. “The revenue expectations priced into that number are staggering,” says Anant Sundaram, a finance professor at Dartmouth’s Tuck School of Business. To justify the IPO price, Sundaram estimates that Facebook will need to see $70 billion in annual revenue by 2021, up from just $3.7 billion in 2011. It’s a massive number, but Facebook may have the means to hit it while achieving Zuck’s goal of careful, focused un-Google-like control. Here are five ways Facebook could prime its income stream–only one of which would cause its CEO to truly regret going public. Facebook is just starting to build on this momentum with new ideas that could lead to potentially huge revenue streams. In January, it began inserting ads into users’ news feeds, one of the most drooled-over stretches of real estate online. These ads–currently called Sponsored Stories–will also brim with what Facebook calls “social context,” meaning that brand messages are highlighted in your feed if your friends like, comment, or take some other action on a company’s post. According to a Nielsen study cited in Facebook’s S-1 filing, messages that include this sort of social context are 50% more memorable than ones without a boost from your pals. As Facebook continues its effort to get each of us to share more links, songs, and (soon) movies and TV shows, advertisers will surely pay extra to ensure that their messages stand out in this ever-more-crowded social universe. Facebook could increase its appeal further by broadcasting these messages on all those sites featuring like buttons, an ad network much like Google’s AdSense. So if your friends are crazy for Ben & Jerry’s, get ready to see a lot of Chunky Monkey ads–and, if social context truly prompts more purchases, also prepare to buy a lot more ice cream. Much has been made of the fact that Facebook’s smartphone and tablet apps and sites–which collectively attract 425 million active users every month–are completely unsullied by commercial messages. This is part of the reason why Facebook’s revenue per user is so much weaker than Google’s–and even Yahoo’s, whose display-advertising business has been decimated by Facebook. Google makes $30 per user; Yahoo, $7. Facebook? $4.39. This can’t possibly last. And when Facebook does turn on its mobile-advertising machine, it will be able to offer marketers something unique: ads that are hypertargeted both socially and geographically, a moving billboard that knows exactly who you are, and where, always. No one but Google has anything even remotely similar, and Google now makes $2.5 billion a year from mobile ads. If Facebook manages to catch a significant chunk of that market, phones all over the world would become ATMs–for the company. To reach Sundaram’s $70 billion revenue goal via advertising sales, Facebook will have to increase sales by an average of about 25% to 30% per year for the next decade. “That’s a steep upward line,” Sundaram points out. “Look at what industry this is coming from–advertising, which is growing at about 4% a year.” In other words, to grow that fast, Facebook will have to steal huge market share from everyone else, including TV, print, radio, and Google. Can it do that? It’s possible, although it is worth noting that Google has struggled in its many efforts to co-opt traditional media spending. Facebook Credits is the site’s virtual currency, now favored primarily by fans of Zynga’s social games, who use it to purchase ad-free screens, or to give themselves prettier pigs on FarmVille. 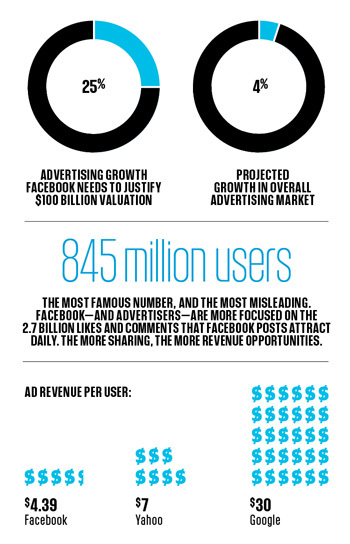 Facebook sold around $500 million of Credits in 2011. As it expands its payment service to other kinds of commerce, the company could see exponential revenue growth. Imagine, for instance, a socially aware dating site built on top of Facebook. Because it would already know what kind of people you like, it could go out and search for a single who shares your interests from among your friends, or their friends, or even another degree beyond that. Want to see who the site picked? Pay a few credits first, please. Another example: Let’s say a Facebook-based HBO app could give you an update every time your friends watch Game of Thrones. If the update inspires you to give the show a try, just click to watch; the show begins, and your account is docked 25 credits, or $2.50. It would be a much stronger version of iTunes. “f-commerce,” as the kids call it, hasn’t been great. Although Procter & Gamble once sold 1,000 packs of diapers in under an hour, several retailers, including Gap, JCPenney, and Nordstrom, opened and promptly shuttered Facebook stores. The secret may lie in finding the best mix of viral promotion and purchasing ease. If Facebook perfected one-click social buying–click a message in your feed to send your friend the pair of jeans she liked on her birthday–could you resist? By analyzing the ways its users interact with nearly every product or service on the planet–by mining all those likes, comments, shares; by noticing when we start and stop our videos and music; and by chronicling where we are when we do it all–Facebook is building an unrivaled repository of human desire. It will never sell your personal data to anyone–that’s one thing users would never accept. But it doesn’t need to; there are potentially huge markets for aggregated bundles of user info. To take just one example, consider the TV market. By analyzing the way users respond to TV shows, Facebook could conceivably sell ratings data that are more valuable than Nielsen’s. It could also serve the movie industry by monitoring how people respond to movie trailers, forecasting which films will soar at the box office and which will sink. The company has only begun to exploit this data stream, and as it does so it may find itself in some unanticipated markets. But thinking of ways to monetize a billion users might require Zuckerberg to consider ideas that once seemed fantastical. Once Facebook hits the market, it will be one of the most-watched stocks in the world. However well protected Zuckerberg may be from hostile investors, there’s no escaping expectations. Any miss in projected revenue would depress the stock, of course. But the size of those disappointments could also hurt hiring prospects, advertiser response, and even user sentiment. If the previous four plans don’t drive the company forward, it may well be tempting for Zuckerberg to walk in the footsteps of his most fervent rival: Throw everything at the wall and see where the dollars stick. But that’s a strategy that would never work. Over the years, pundits have seen hints of Facebook building a phone and a search engine, launching a mobile-apps platform, and perhaps even offering up its data centers to developers, Amazon-style. If you pause to game these plans out, most are closer to fantasy. While the tech press would relish a Facebook search engine and the ensuing Silicon Valley war it might create, Facebook Search, were it ever to emerge, would mostly be a tactical move–a way to keep Google on its toes, rather than a bid for real revenue. The same goes for the smartphone business. It is quite likely, as several reports have suggested, that Facebook is experimenting with customizing a version of Google’s Android operating system to create its own socially aware mobile devices. A Facebook phone would give Zuckerberg a direct line to his mobile users. But getting into the mobile-device business now, with Apple, Google, and Microsoft all far ahead, would only be a long-shot plan. For the established players who don’t have a fruit-inspired logo, marketing and distributing smartphones hasn’t proven to be an extremely lucrative endeavor.